For pilots, flying at night is mostly a pleasant task. It's often quiet as the radio chatter dies down for the day and smooth as the convective turbulence settles. However, night flight also comes with its own set of challenges, including nighttime illusions. Pilots are trained to identify these illusions and ignore them or compensate for them while flying, but the night sky can be deceptive to even the best of pilots. Here are nine types of illusions that pilots are confronted with. The black hole approach occurs during an approach over a large, unlit area. Often it happens over bodies of water, but it can occur over any unlit terrain. With no visual reference over a large black hole, a pilot can easily overshoot or undershoot the position on the approach, resulting in an unstable approach. When experiencing a black hole approach illusion, a pilot should rely on the aircraft's instruments, remain at an appropriate altitude and work to maintain a stable approach, including a stable airspeed and descent rate. Autokinesis is an illusion of the eye. At night, when a pilot's eye stares at a light against a dark background with no other visual references around it, such as a star or the light from another aircraft, the pilot will get the impression that the light is moving. Just knowing about this illusion helps demystify it, and moving the eyes around or looking to the side of a lit object can help. VFR pilots rely heavily on the natural horizon of the Earth to maintain straight and level flight during the day. At night, when the sun goes down and there's no horizon to look at, the mind will often try to seek one out, unsuccessfully. Often times, a pilot will interpret a misshapen cloud or the lights of a highway as a horizon and will bank the aircraft so that it's attitude is straight and level in relation to the newfound false horizon. This is trouble, of course, as the result, in this case, is an unwanted consistent turn. A pilot flying at night needs to rely heavily on the attitude indicator in the aircraft to make sure the plane remains straight and level while recognizing such false horizons. Flicker vertigo is a rare condition in which the brain doesn't process flickering light very accurately. In propeller planes, it can be caused by the strobe lights at night flickering against the propeller or from the sunlight on the propeller, and it results in disorientation and nausea. The good news is that along with its rare occurrence, it's fairly easy to rectify—the pilot should just turn off the light or turn away from the sun. Bright runway lights can cause the pilot to feel like the aircraft is lower than it really is, creating a situation in which a higher-than-normal approach is flown to compensate for what they feel is a high approach. An unstable approach condition is likely to occur if the pilot doesn't trust the instruments. When the terrain slopes upward just before the approach end of the runway, the pilot can be tricked into believing the aircraft is too high, causing them to compensate by flying lower. Conversely, a downhill slope will cause a pilot to think they are too low, resulting in a higher-than-normal glide path. A wider-than-usual runway will cause a pilot to think they are low. In an effort to compensate, they might fly a higher-than-normal approach, or pitch up to an unsafe airspeed on final approach. Rain, fog, and haze can all cause pilots to perceive distance inaccurately. 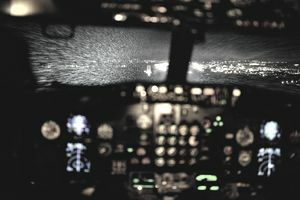 Rain, for example, can cause approach and runway lights to seem brighter at night, causing a pilot to feel like they're lower than they should be, in which case they might overcorrect to a higher-than-normal approach. And fog and haze can both make the runway look farther away than it really is, causing an illusion of being too high. Snow-covered terrain combined with a gray overcast layer can cause a complete white-out illusion that makes it difficult for a pilot to gain any sort of visual reference, which means it's tough for a pilot to determine how high or low they are on the approach. Paying close attention to approach altitudes and airspeeds will help correct for this. Illusions can cause disorientation in pilots, especially at night or in low-visibility conditions. For almost all of these illusions, the fix is simple: Trust the instruments, maintain a stable approach speed and appropriate altitudes for the approach segments being flown, and be mentally prepared to recognize an illusion when it's occurring.